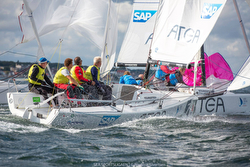 (Skovshoved, Denmark)- This past weekend, the Skovshoved Sailing Club, together with the Danish Sailing League, hosted the third of four events in their season series off Skovshoved. The eighteen teams that were participating had good weather all three days. Winning the third event and cementing their position at the top of the leaderboard for the season was the KDY SHARKS. 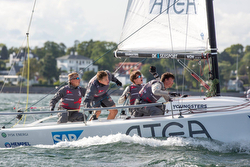 The team consisted of Michael Hestbæk, Thomas Hartvig, Henning Lambertsen and Niels Gramkov. After decimating the fleet in Skovshoved, they now count a 2-1-1 tally for a total of 4 pts for the season series. KALØVIG COBRAS made a big jump in the last day and secured 2nd place as they got two bullets in the last two races. It was undoubtedly a very good event for the KALØVIG COBRAS team (Lars Vilhelmsen, Sophus Jarvig, Nikolai Tiedemann, & Jesper Vogelius). The FAABORG FALCONS ended in 3rd place, 9 points behind.